Johnson & Johnson (J&J) business unit DePuy Synthes has introduced new 3D simulation assisted orthopaedic external circular fixation device to treat patients with limb deformity. The new Maxframe multi-axial correction system is an external circular fixation device developed to gradually correct bone or soft tissue deformities in the arm, leg, foot or ankle. Maxframe system features 3D planning software, which allows to improve accuracy of the deformity correction plan and reduce overall treatment time. The 3D planning software helps to create precise patient treatment plans through using advanced algorithms, avoiding the need for manual measurements. 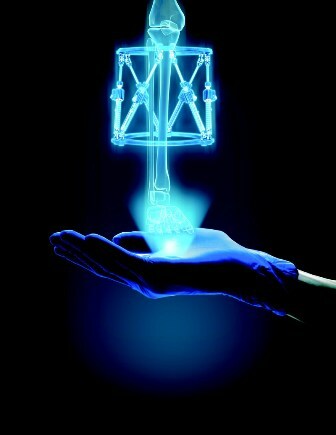 Assure-Strut technology will allow patients to adjust struts on the Maxframe system as per the custom treatment plan. Maxframe system will be used for the treatment of adults and children, including fracture fixation, pseudoarthrosis of long bones, limb lengthening, joint arthrodesis, infected fractures or nonunions, correction of bony or soft tissue deformities and correction of segmental defects. DePuy Synthes trauma, CMF, biomaterials and veterinary portfolios worldwide platform leader I.V. Hall said: "There is a significant unmet need for treatment options that reduce both the burden to patients with limb deformities as well as surgical complexity. "With the launch of the Maxframe system, we are building on our long history of innovation, excellence in service and support for surgeons with unique 3D planning software and digital tools that help address these needs and enhance patient and surgeon satisfaction." Image: The Maxframe multi-axial correction system. Photo: courtesy of PRNewsfoto / DePuy Synthes.